When you need to be sure that you are able to take full advantage of your industrial processes and optimize efficiencies, it will pay to acquire the right equipment for the job. Agilis Technologies Mist Eliminators recapture product that would otherwise be wasted. It does not matter if you call this a Mist Elimi­nator, Demister, Droplet Removal Device, or Droplet Collection System; Agilis Technologies simply builds the best. Using the highest quality material, unparalleled quality construction, innovative engineer­ing and the most superlative performance to give you the longest lasting, best performing product available on the market. Contact Agilis Technologies and let our Engineers guide you through the selection process so that you and your company get the best product at the best price for your specific application. Agilis HF1A Mist Eliminators use profile-shaped blades that rely on impingement technology to separate the mist and droplets from the gas stream. The multi-hook design maximizes the droplet removal process. This technology has been proven to provide the most effective mist removal possible. Even in low-pressure drop systems, the Agilis Mist Eliminator profile shape can remove up to 99.5% of all droplets down to 9 microns in diameter. These droplets, though invisible to the naked eye, are effectively and efficiently captured and drained away from the process stream, where they can be returned to the process or disposed of as necessary. Agilis HF3 Mist Eliminators use our most advanced profile design that allows for excellent droplet removal at the highest of flow rates. The multi-hook design maximizes the droplet removal process. These droplets, though invisible to the naked eye, are effec­tively and efficiently captured and drained away from the process stream, where they can be returned to the process or disposed of as necessary. Agilis Technologies Vertical Flow (VF) stainless steel style uses a sloped design to improve liquid drainage and to keep the blades clean in dirty environments. The absence of sharp corners, pockets, and multiple small crevasses allows the Agilis unit to operate over a wide range of flows. Even in low-pressure drop applications, the Agilis Technologies will remove 99.5% of all droplets down to 18 microns at the optimum design veloc­ity of 1000 fpm. While the units do operate at far higher velocities the optimum velocity is deter­mined by the maximum velocity, which will still allow the collected droplets to fall against the gas flow. The major advantage of the Agilis construc­tion method is that we avoid just spot welding the profiles which can cause premature failure due to excessive corrosion and vibration. Agilis Technologies Vertical Flow (VF1a) plastic mist eliminators use the same effective profile that is used in our horizontal flow devices. The VF Style uses a sloped design to improve liquid drainage and to keep the blades clean in dirty environments. The absence of sharp corners, pockets and multiple small crevasses allow the Agilis unit to operate over a wide range of flows. Even in low-pressure drop applications, the Agilis Technologies will remove 99½% of all droplets down to 18 microns at the optimum design velocity of 1000 fpm. While the units do operate at far higher velocities the optimum velocity is determined by the maximum velocity, which will still allow the collected droplets to fall against the gas flow. Heated Mist Eliminators are an efficient means of eliminating mist and liquid droplets from an air stream while preventing ice and snow buildup. Great for cold-weather marine operations or fac­tories looking intake air free from moisture during the cold and winter season. Applications include Turbine inlets, Arctic vessels, Building HVAC inlets, machine room inlets or moisture protection. Options include; Insect Screens, Hatch Covers, Marine Style Inlets, Automated Controls, and multiple mounting configurations. Mesh Pads are an alternative to Profile type mist eliminators for use in clean environments with very small droplet sizes. Mesh pads can be used success­fully in applications where droplet sizes are as small as 2 microns. At this diameter, a properly designed mesh pad will remove up to 99.9% of all droplets 2 microns and larger. This is referred to as the Limit Drop size. Mesh pads are designed to operate best at gas velocities of 100 to 550 fpm with thicknesses of 2” to 16” in the direction of gas flow. At Agilis Technologies we use a mild crimp on our pads to provide superior efficiency while keeping the pres­sure drop to a minimum. All Agilis Technologies mesh pads are custom designed for your application and can be provided with frames, with retaining grids or simply wired together as a flexible pad. Mesh pads can collect droplets down to 2 microns but limit air velocities and can generate higher-pressure drop. Removal of sea spray is an important compo­nent in protecting valuable equipment in your vessel. Use of an Agilis Technologies Demister (Mist Eliminator) and fan system can provide you with excellent protection. Our systems can be as simple as a single Demister (mist elimina­tor) designed to fit the side of your vessel or be as sophisticated as to include a blower or fan system, measuring equipment for pressure and temperature and Green Water removal designs. Each mist eliminator is custom designed to fit your specific application and can be provided in a variety of orientations. Agilis Oil/Water separators are a must in oily environments and processes. Built using the same Agilis attention to quality, these units will last a long time operating under the oiliest of conditions. Let our Design and Estimating team create a custom solution for your application. Agilis’s profile mist eliminators are built rugged and durable with excellent perfor­mance and last a very long time, but they will need occasional cleaning in order to maintain that performance. The cleaning frequency will depend entirely on the dirt and contaminants in the air stream. An option that many customers favor in order to reduce maintenance costs and downtime is the Agilis Spray Wash system. Agilis Technologies is constantly trying to find better ways to meet our customers, requirements and needs thusly were born the Agilis Pre-coalescer. If you need to gather smaller droplets without a big reduction in pressure drop we have designed our Agilis Pre-coalescer to work upstream from our Profile mist eliminators to provide that additional performance that some applications require. Agilis Industrial Evaporative Cooling Systems are a low cost and effective means to cool equipment for industrial applications. Fin–Fan systems, Data Centers, Computer Co-Location Centers, and Gas Transmission facilities are all applications that benefit from the addition of an Agilis Industrial Evaporative Cooler. Agilis Media-based systems are well proven. This type of system uses a paper, fiberglass or plastic corrugated media to distrib­ute water in a very thin sheet. Air passing over this thin sheet of water evaporates the water and lowers the air temperature, hence, Evaporative Cooling. Media-based evaporative cooling systems are low cost, user-friendly, and offer up to 90% effectiveness. Evaporative cooling offers many benefits for cooling large spaces and equipment rooms. 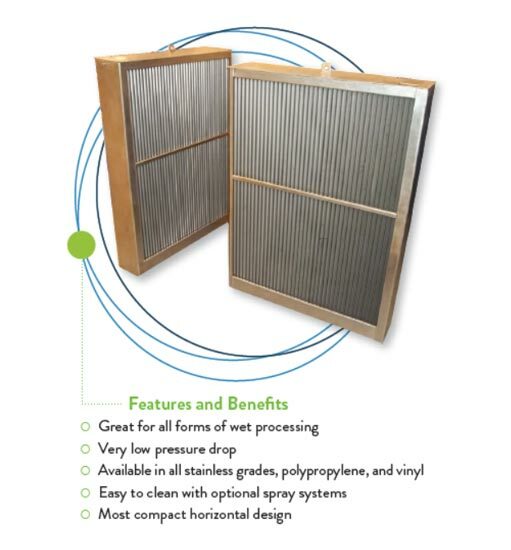 Direct evaporative coolers draw air from the outside environment which can often be dirty or contaminated. For sensitive applications such as data centers, electronic rooms or VFD drive buildings, maintaining clean, cool air is paramount. When using an Indirect system the moist, cool air from the evaporative cooling unit is not transmit­ted directly into the equipment room but rather the cooler temperature is exchanged to existing room air through the use of a heat exchanger. This efficient method also prevents any increase in humidity in the equipment room making the room a more pleasant work environment for personnel.